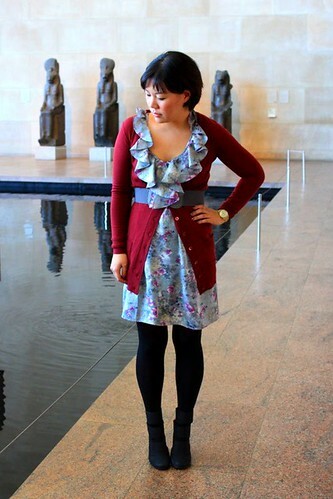 This week's outfit of the week goes to Rosa An from Love at First Shop!! Oooohh, how I love this outfit! Lets start with the gorgeous dress she is wearing. I love the colors and the print. Then she added this rich raspberry colored cardi that looks so beautiful with the color of the dress. The perfect finishing touch is the way the ruffles peek through the cardi. I absolutely love how colorful, elegant, and pretty she looks. Congrats Rosa An!!! This look is wonderful. I really love how she made a summer dress work so well in winter. I have a similar dress in my closet that has been waiting for warmer weather but I may take it out this week in a look like this one. she is so cute! always dresses amazing! Really love the dress and the blues and raspberry color combo.